Kneeling on a cloud, St Teresa floats in a mandorla of radiance, watched by her Bishop who prays at an altar with two monks. Close to a kneeling nun on the right are a group of the Bishop’s friends who observe the scene through a window. A closed book (Bible?) and rosary lie on the ground. 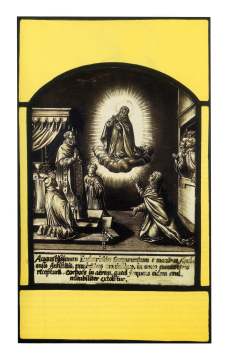 The panel is based on an engraving by Adriaen Collaert, printed by Joannes Galle 1630, in the series 'Vita St Virginis Teresiae...', Plate 17, inscribed Adrien Collaert sculp. The text follows that of the engraving in its entirety: Augustissimium Eucharistiae Sacramentum e manibus Abul/ ensis Antistitis, praesentibus monialibus, in nouo monasterio/ receptura, corpore in aerem, quod frequens eidem erat,/ mirabiliter extollitur. Keeping to the format of the other panels in this set which feature an arched top (SG61, SG63, SG65, SG67, SG68, SG86, and SG110), the glass painter has here completed the curving top of the radiant mandorla. SG91 illustrates another scene from this cycle but in a different format. The octagonal lantern in the Breakfast Room retains seven of its original eight glazing panels with subjects set within colour glass borders. Five of these depict scenes from the life of St Teresa of Avila, the other two illustrate biblical subjects from the lives of Joseph and his brother Benjamin. Soane, in his 1830, 1832 and 1835 editions of the Description says In the Dome is an octangular [sic] Lantern with eight scriptural subjects, surmounted by a bell-light. Teresa of Avila was born in 1515, died in 1582, and was canonised in 1622. She experienced many visions, some ecstatic and heavenly, others with devilish temptations, and she frequently heard voices. The most famous vision of the Saint was the piercing of her heart, or transverberation, by an arrow held by an angel, a scene immortalised by Bernini as St Teresa in Ecstasy in the Cornaro Chapel, Rome. Her story was well documented in her lifetime and there are extant portraits of her from life. The stained glass panels are copied from a series of prints by Adrien Collaert, based closely on her life and documented appearance, which were published in 1630. This panel, SG63, shows her levitation during the celebration of Mass which, despite causing her some embarrassment, did not prevent the bishop bringing his friends to witness the event. In another scene, SG67, she is shown writing while the Holy Spirit in the form of a dove speaks into her ear. The complete series of 24 plates in the Witt Print Collection, Courtauld Institute Galleries, London, which is dated 1630 on the title page. Hollstein IV, Adriaen Collaert, 230-248, lists nineteen plates and a frontispiece dated 1613.